DYNATUNE RIDE & HANDLING. THE WORKBOOK. DYNATUNE has been in development for about 20 years in MS EXCEL. In those 20 years a total 46 different sheets have been integrated into one workbook (EXPERT Version). These 46 worksheets contain a grand total of 6.142.150 cells with a subtotal of 336.481 cells with Formulas, 271.261 cells with Constant Values, 39886 Conditionally Formatted Cells and 546 defined Calculation Variables. In all versions of DYNATUNE exists a specific calculation of the physical limits of the vehicle (adapted to the complexity of the model). Furthermore in the "BASE-", "PRO-" and "EXPERT" Version are sophisticated tools available for defining the optimal brake distribution for achieving maximum deceleration and best front to rear drive torque distribution for achieving maximum (AWD) longitudinal acceleration. DYNATUNE offers in all versions the feature of adding up to 8 masses (passengers & pay-load) with individual positions in the vehicle. This will permit the user to simulate correct GVW conditions for all kind of vehicles or if applied in a racing environment the effect of ballast weights can be analyzed correctly. 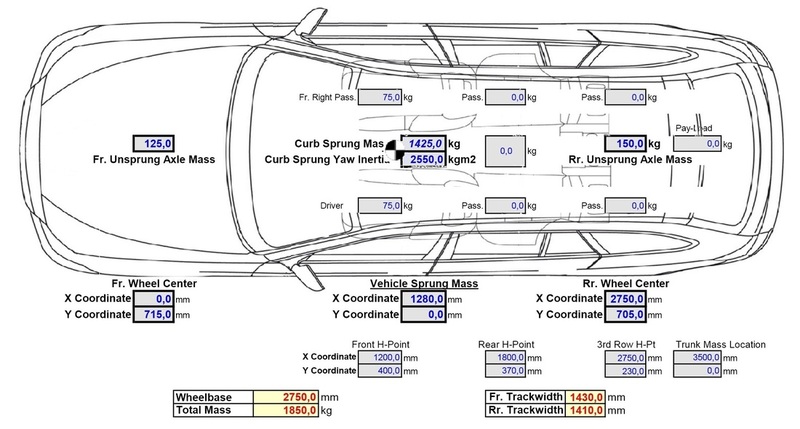 The resulting overall vehicle weight, axle load distribution, wheel deflections, vehicle inertia and resulting center of gravity location are calculated automatically and are being presented as delta values with respect to baseline CURB condition. The "RACE-" & "EXPERT" Version of DYNATUNE provide the possibility of using sophisticated aerodynamic AEROMAPS in which Lift and/or Drag Coefficients are represented as a function of front and rear ride-height (with non-linear curve-fitting allowing correct interpolation). The AEROMAPS are an indispensable tool for any basic race-engineering analysis of dynamics on wing-cars and the feature comes with a user tool which allows direct comparison between theoretical possible maximum lateral acceleration vs. realistically achievable lateral acceleration with installed aerodynamic balance. In the "LIGHT-", "BASE-" and "PRO" Version are only static aerodynamic lift coefficients are available, which in the "LIGHT" Version are limited to typical standard road car values. In DYNATUNE 7.1 for "RACE-" and onwards Versions additionally specific values for Tire Drag & Lift Coefficients can be entered in order to calculate more accurately open wheel vehicles. CHASSIS data are the backbone of DYNATUNE. Next to the usual spring and rollbar rates there is a section table available for the most important elasto-kinematic suspension data. These parameters relate to the most commonly measured data on K&C rigs or most commonly evaluated output data from Multi-Body Dynamics Programs. Using the tabular approach allows correct parametric simulation of almost all types of suspensions. DYNATUNE permits analysis from a rigid axle to a mono-spring open wheel race car setup ("RACE-" & "EXPERT" Version). 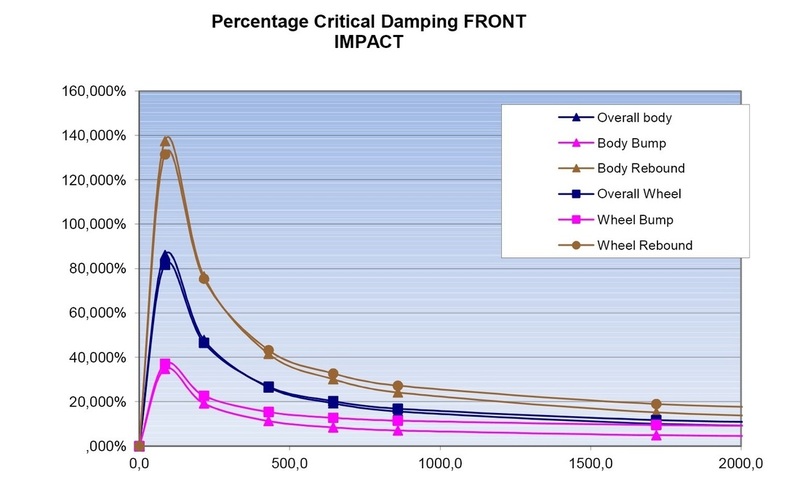 Damper characteristics are handled in a unique sheet providing various levels of complexity and detailed ride analysis. DYNATUNE provides in all versions convenient user tools for simple data manipulation. Many times data in the wheel plane are not available or detailed spring rates, anti-roll bar stiffness are not in the right format. These simple tools help in-experienced users or stand alone race engineers to calculate correct input data for DYNATUNE and many years of application show that these tools are also to experienced users an very appreciated help for quickly changing between various data representations. From "LIGHT-" Version onwards in DYNATUNE a TIRE DATA TOOL permits the user to plot all the tire parameters from the "BASE TIRE MODEL" in a typical tire data representation graph. Next to the convenience of being able to use a knowledge base the tool provides also the possibility of creating your own tire in a very easy and straightforward way. The data can be populated into the model by automatic routines minimizing margin for error. The Tire Data Base is in the "LIGHT", "BASE" and "PRO" Version limited to typical road tire values. From "LIGHT" Version onwards in DYNATUNE a SUSPENSION DATA TOOL permits the user to select from a range of commonly used suspensions the most important Kinematics & Elastokinematic Data. For those users who are not experts in K&C data this small knowledge base can provide a meaningful help in creating a correct model. The database comes with typical road suspension data and in "RACE" Version and above also with interesting race suspension data. An automatic data population procedure minimizes margin for error in the model input data. DYNATUNE offers a variety of standard Handling Maneuvers in all Versions. Besides typical graphs for each Handling Maneuver a range of commonly used vehicle dynamics metrics are being offered. These metrics are many times key performance indexes (KPI) used for tracking program development advancements or refer to typical reference parameters for up-front benchmarking. Since all these maneuvers are based on a bicycle model any transient damper effects are not considered. Calculation of linear range Understeer Budget and key metrics. In the Base- and Pro.Version additional effects of non-linear bump-stops can be simulated for a specific load condition. Exclusively in the "PRO-", "RACE-" and "EXPERT" Version a full non-linear sweep from 0 to maximum lateral acceleration can be executed with the 6-DOF vehicle model allowing in depth analysis of vehicle behavior. 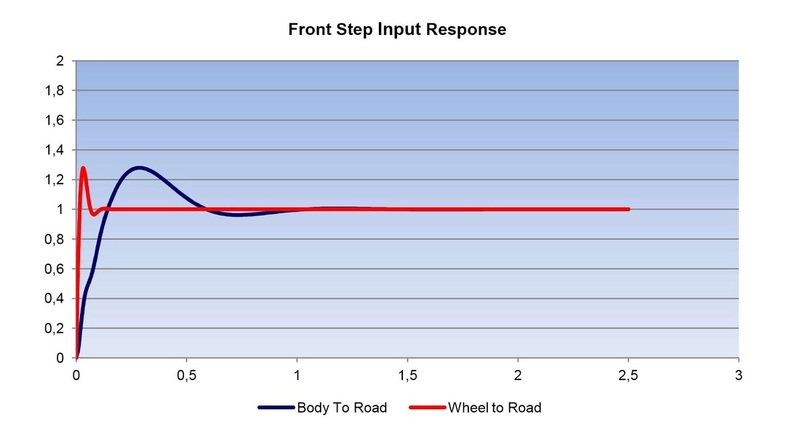 The Step Steer Response based on linear bicycle model provides typical generic time domain responses for Yaw Gain, Slip Angle & Lateral Acceleration. Various commonly used reference key metrics are offered in all program versions. By providing a specific Steering Wheel Angle a real life test event can be simulated. 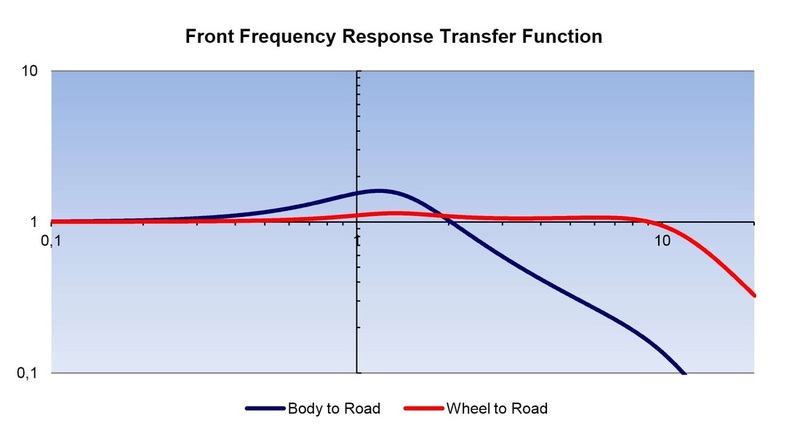 Frequency Steer Response from linear bicycle model providing frequency domain transfer functions for Yaw Gain, Slip Angle and Lateral Acceleration as a function of Steering Wheel Angle or Lateral Acceleration. Various commonly used key metrics are available. For model validation purpose a specific Steering Wheel Angle can be entered allowing data comparison at the resulting lateral acceleration. In "PRO-", "RACE-" and "EXPERT" Versions of DYNATUNE an added feature permits to calculate the PERFORMANCE ENVELOPE of combined Lateral and Longitudinal Acceleration for various Velocities. 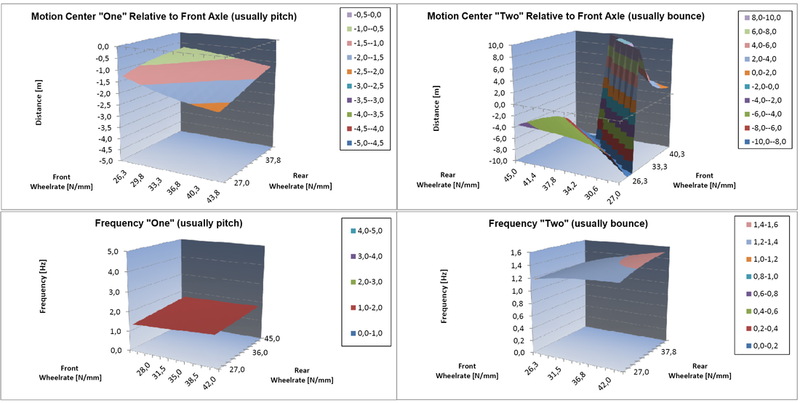 3-Dimensional Carpet Plots show conveniently the lateral performance capabilities under traction and braking and indicate where the vehicle might have deficiencies. Additionally the user can set a limit to the Understeer Gradient and Vehicle Side Slip Angle Gradient allowing thus also subjective Understeer / Oversteer perceptions to be considered in defining the performance limits of the vehicle. The calculation of the PERFORMANCE ENVELOPE can be executed with a LINEAR Calculation (predicting the limit by linear prediction/extrapolation) and a more accurate NON-LINEAR iterative calculation, which is however more time consuming due to the number of iterations needed to find the physical limits. These PERFORMANCE ENVELOPES describe the vehicle sufficiently accurate to act as a "black box" response surface. In fact, they are the ideal foundation for a LAPTIME SIMULATION in which for every point on the track the optimal operating point for Longitudinal and Lateral Acceleration must be found. Based on the previously mentioned PERFORMANCE ENVELOPE DYNATUNE 7.0 comes in the "PRO-","RACE-" and "EXPERT" Versions with a unique quasi 4 Dimensional graphic presentation of the Understeer Gradient and the Rear Vehicle Side Slip Angle Gradient. Using the data points from the PERFORMANCE ENVELOPE Calculations a unique 4 dimensional data set can be extracted for Understeer and Rear Side Slip Angle Gradients. Advanced Iso-metric projection algorithms permit to create and project a response surface for Understeer/SSA Gradient as a function of Lateral Acceleration, Longitudinal Acceleration and Velocity. This kind of graphic representation permits to make the whole operating range of vehicle balance visible in a few unique set of graphs. Any problematic areas of the car can be identified immediately and can be looked at in additional specific analysis. A very powerful and effective tool indeed for the expert eye. The Procedure can be applied both in a LINEAR as in a NON-LINEAR mode and comes with 4 Pre-Defined Custom Graphs covering all combined Braking/Acceleration & Lateral Acceleration situations. Each Custom Graph provides the possibility to look at the surface plot from various angles. If wanted specific viewing angles can be set manually in each view. IN DYNATUNE "RACE-" & "EXPERT" Version a convenient test-track & circuit layout tool allows an easy creation of a test- track, circuit or a rally stage. Parting from an obligatory minimum of 4 corners and a start & finish straight, the user can create a track with up to a total of 20 corners. Any corner is defined by 5 points: Corner Entry, Intermediate Entry Point, Corner Apex, Intermediate Exit Point and Corner Exit Point. Straights are defined by Corner Exit and next Corner Entry Point. All of These Points MUST reflect the driving line on the Test-Track/Circuit. Based on the 5 corner points the corresponding Corner Radii will be calculated and if not following ideal driving line (rule of diminishing radius on entry & increasing radius on corner exit) error flags will be shown, identifying where the data needs to be corrected. The Feature comes with 3 complementary Test-Tracks, a typical High Speed Handling Track, a typical Low Speed Handling Track and an example of a short Generic Test-Track with 6 constant radius corners. The Major new feature in DYNATUNE "RACE-" & "EXPERT" Version is the quasi-static 2- Dimensional LAPTIME SIMULATOR (without consideration of any inertial or transient damping effects). Using the PERFORMANCE ENVELOPES as reference for the vehicle performance an optimization algorithm minimizes the time needed to drive a lap on a given circuit by finding in each corner the best compromise between lateral and longitudinal acceleration and on each straight the best braking point. Beyond that, logic decision functions are monitoring and if necessary controlling whether any modifications need to be made to these algorithms. The CONTROL PANEL shows in a typical "time table" format the most important data like section times, top - speeds and braking points both for the actual vehicle setup as for a reference setup. LAPTIME SIMULATION can be performed either based on a LINEAR PERFORMANCE ENVELOPE or a NON-LINEAR PERFORMANCE ENVELOPE (with consequent increased simulation times) and the tool provides additionally the possibility of creating a time history data set of a simulated lap of all DYNATUNE parameters for more detailed in depth analysis of each distance point of that lap. 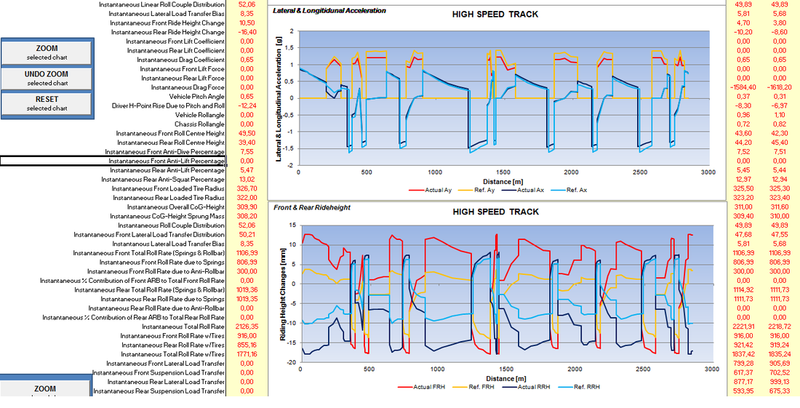 In the "RACE-" & "EXPERT" Version of DYNATUNE a convenient LAP RESULTS Sheet allows a quick comparison of detailed time history data of a Reference Lap with a current Actual Lap. The Data Sheet contains all important metrics from DYNATUNE and is fully customizable - in analogy with the RESULTS sheet of the Objective Test Procedures. A "Dynamic Zoom" feature permits to mouse-zoom directly into the graphs making closer looks & detailed comparisons very quick and efficient. Furthermore the time history data of the Reference Lap can be exported to an external file for eventual custom post-processing or other in-house use. Ride Frequency Transfer Function allowing analysis of frequency dependent transient damping characteristics with some reference key metric calculation. The "PRO-","RACE-" & "EXPERT" Version of DYNATUNE includes a freely customizable RESULTS Sheet. It comes standard with all Input and Output Data of your current vehicle model and provides the possibility of setting your actual Data Set as a Reference Data Set or reload a Reference Data Set to your Actual Data Set.